Intelliplus have unveiled a new cable and charge tester called the qualMeter XT which is now available to back with early bird pledges starting from as little as CAD$14. The qualMeter XTOffers an extension board and DIY kit, which has been specifically created for the qualMeter X to extend its functionalities and to enable its firmware to be easily upgraded. Watch the demonstration video below to learn more about the qualMeter XT which is now available to back via Kickstarter and has already raised its required pledge goal to make sure it can progress to the next stage of manufacture. The Basic version gives you the ability to upgrade firmware of qualMeter X and the ability to have Beeping Indication with the testing results. The Network version has embedded the network cable connectivity testing upon the XT Basic version. It brings you the ability to test your RJ45 twisted-pair network cable and even the RJ11 phone cable. 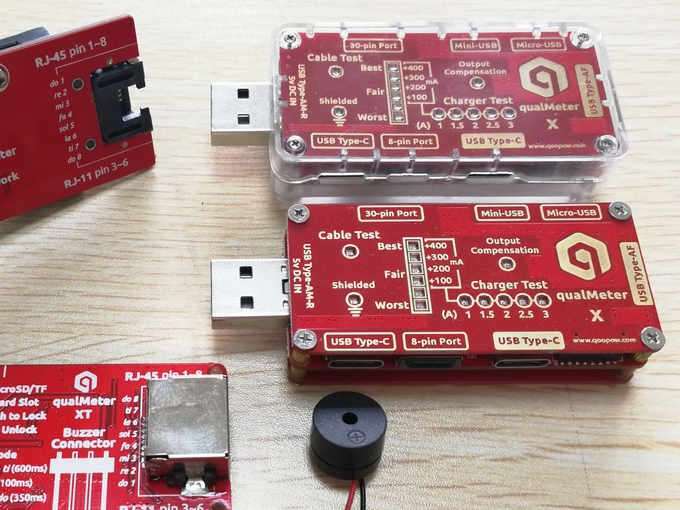 The XT Network Kit comes with two parts, an XT Network Board which is going to be mounted on qualMeter X and will be plugged at one end of the testing network cable. And an XT Network Transmitter which will need to install a 9V battery on it to be used at another end of the testing network cable. As we have promised, the original qualMeter X was designed to be upgradable which allows qualMeter X to extend its function and fine tune its testing ability and results in the future. Now, with qualMeter XT, you can easily upgrade the firmware of qualMeter X version via a commonly used MicroSD/TF card. Inspired by one of our previous Angels, THANK YOU! qualMeter XT has integrated an unique Beeping Indication coding system to help people who have difficulties on reading the LED indicators. The Beeping Indication is also a very useful and convenient way to quickly knowing the testing results without visually read the LED indicators. For more information on the new qualMeter XT jump over to the Kickstarter website for details by following the link below.